As one of the most versatile jazz improvisers of our time, Jaki Byard was less known for his compositional prowess than his exuberant and slightly off-kilter piano stylings. But thanks to his years of teaching and mentoring at institutions such as the New England Conservatory of Music and The Manhattan School of Music, we now have a constellation of Byard ‘torch-bearers’ who have made it their business to shed light on what was previously a dim memory. 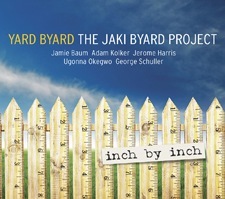 Yard Byard: The Jaki Byard Project has been an idea waiting to happen. When long-time friends Jamie Baum and George Schuller teamed up with fellow New England Conservatory alumni Jerome Harris and Adam Kolker in 2010, they decided it was time to pool several of Jaki’s old charts, dust them off, and bring them back to life. Adding bassist extraordinaire Ugonna Okegwo to the mix, it was about time an exploration of this interesting, timeless music was given its due. Inch By Inch is a collaborative effort between mgrs. Baum, Kolker, Harris, Okegwo and Schuller…their first recording featuring such Byard favorites as Strolling Along, Aluminum Baby, and Ode To Charlie Parker along with three of his family tributes: Toni, Gaeta and Garr; and a bevy of other more obscure Byard originals such as Flight of the Fly, Twelve, Fadism, St. Marks Place Among The Sewers, Dolphy, and Inch By Inch, Yard Byard (first time recorded!). All arrangements by Yard Byard except where noted.